It could be that soon parachute-jumping rabbits, turtles with rifles and dogs with cannons attack the police in or around the Hambach Forest. 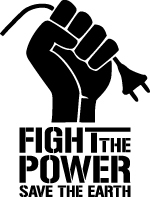 It is also possible that the ants with their pit helmets are there and demonstrate for civil rights, and the bats make it clear once more on their banners that there is nothing to sell. “Bild-Zeitung” and its editor Peter Poensgen are certainly on the track of a very hot thing. 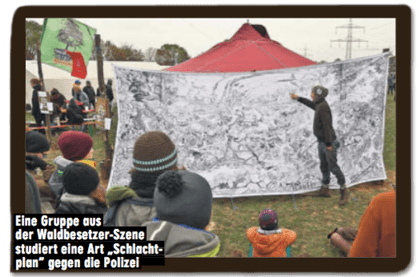 The scene of violence Hambach Forest: Strategies against the police are planned on the basis of a huge map. 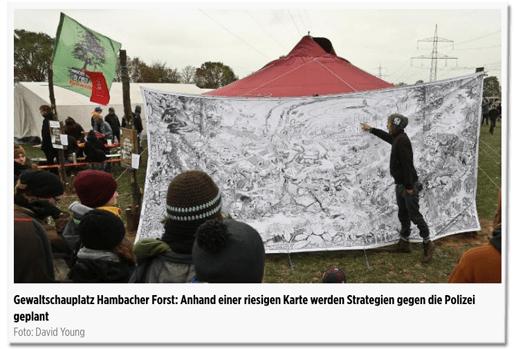 Headline in the online version: “The ‘Violence University’ of the Hambach activists” (which already in the first sentence of the article is called “almost like a university for violence and rioting”). 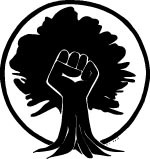 By which they mean the skill-sharing camps where activists also impart skills to other activists that may be useful for civil disobedience. So during one of these camps, a man is standing by a large billboard, allegedly planning “strategies against the police” with his audience. But the “huge map” is not suitable at all for that. 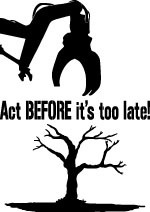 For it is a print of the hidden object picture “The True Cost of Coal”, drawn by the Beehive Design Collective. 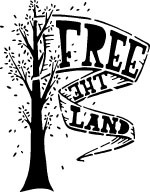 This network of artists provides activists with large illustrations for their work, for example in skill-sharing camps. 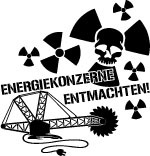 On the copy shown by “Bild” and Bild.de, you can find the parachute jumping hare, the turtle with the rifle, the dog with the cannon, the ant with the pit helmet, the bat with the protest plate and many other animals, whose habitat is destroyed by coal mining, excavators and bulldozers. This is the “scene of violence Hambach Forest”, which “Bild” calls out. PS: The next skillshare will take place from April 12th to 24th, 2019 in forest and meadow. In German there is a saying “shooting on sparrows with a cannon” which, roughly translated, means “cracking a walnut with a sledgehammer”.